All boat operators in Canada must have a Boat Operator Card or they risk expensive fines. There is no minimum age to get certified and no age exemption. The length of the boat does not matter anymore, or the size of the engine. 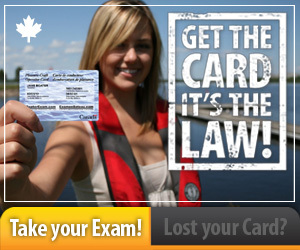 The pleasure craft operating (licence) card is good-for-life and is recognized across Canada. The Pleasure Craft Operator Card regulations exist to encourage boaters to evaluate their capabilities and limits, to prepare themselves adequately before heading out, and to be responsible on the water. As of Last Year - all boaters are required to have the Pleasure Craft Operator Card in order to operate a powered watercraft. There is no grandfather clause or age exemption – this law applies to all boaters. Powered watercraft includes watercraft fitted with any size motor — even an electric trolling motor. If you need the study guide you can download it by 'right clicking' on this link BC Boating Study Guide and select 'save target as'. Here is a link if you have a sailboat and would like to obtain a Boat operators card for Sailboats and or Boating Operator Licence's for USA.